PARIS: Airbus is preparing to roll out a novel A380 wingtip design to rally support for the world’s largest passenger jet by improving its fuel efficiency, according to a prototype seen on Saturday. A Reuters photographer got up close to the roughly three-meter-high split wingtip which has been installed on an A380 belonging to the Air and Space Museum at Le Bourget airport, where the Paris Airshow opens on Monday. It confirms an upgrade reported by Reuters and Usine Nouvelle on Friday. Airbus declined comment. Drag-reducing ‘scimitar’ split wingtips have been used on Boeing’s medium-haul Boeing 737 MAX, but never on a jetliner the size of the A380, which has a 79.9-metre (262-foot) wingspan. The aircraft sporting the prototype ‘winglet’ will be towed out to join others on display at the June 19-25 air show, giving airlines a glimpse of an improvement that Airbus hopes will turn around weak sales of its flagship double-decker. However, a new clash is looming with rival Boeing over the future for such four-engined passenger aircraft, which have seen production fall and which also include the Boeing 747-8. Boeing looks set to revise down or even scrap its 20-year forecast for such ‘very large aircraft’ in a survey next week. “The very big airplane market for the last 10-15 years has been moving downward and downward,” Marketing Vice President Randy Tinseth told the Paris Air Forum on Friday. “That very big end of the market, maybe one percent, is going to be very, very small,” he said, adding that the 555-seat A380 would have to be made longer to become economic and that there was little market for such a large plane. Eric Schulz, president of civil aerospace at Rolls-Royce, whose engines are offered on the A380, told the same conference travel congestion underpinned demand for big jumbos. “I am convinced that without a massive and significant improvement in airport installations and air traffic control routes, there will be still a lot of congested routes and if anything the city pairs will grow for bigger airplanes”. But he said questions remain over to what extent that demand would be met by four-engined jets like the A380 or big twinjets closer to 400 seats, like the Boeing 777-9 and Airbus A350-1000. 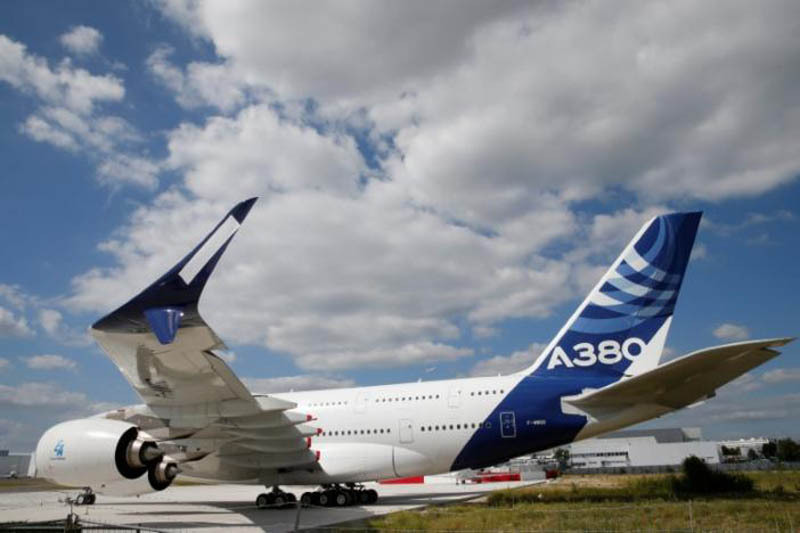 Airbus last week revised down its forecast for the A380 category by six percent to 1,184 aircraft, though at four percent of total deliveries this remains more optimistic than Boeing.